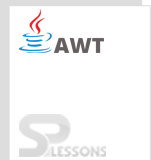 AWT Container is a component and holds all other components. Container is a sub-class of the component class and, super-class of all container classes. AWT Container Container sub-classes are also containers i.e containers contains other containers. Layout Manager is assigned to every container, which helps in making changes using the setlayout() method. 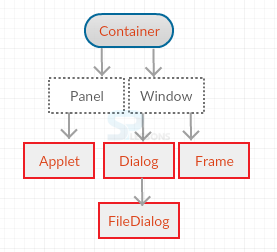 Applets has the default container with default LayoutManager called FlowLayout. add() : Component is included in the container by overloading this method. invalidate() : The components that are setup in the container can be invalidated. validated(): The components that are invalidated by using the above method invalidate() can be validated again using validate(). Panel is an area containing components, which can be divided further into rectangular pieces and contains other panels if required. Panel will have LayoutManager explicitly, which helps in performing other operations that may become burden to the single LayoutManager. The default LayoutManager is FlowLayout. The window class of a container does not contain any borders & menubar and is a top-level window. As Window class extends from the Container class, other components like textfields, and buttons can be added to a window. These components can be arranged by using a LayoutManager. The default LayoutManager of Window class is BorderLayout. Frame is considered as a window with a menu bar, borders and titles in real-time environment. A frame can be modified as per the requirement. The default LayoutManager is BorderLayout. Frames can divide the data into different windows. Otherwise this can be used, if present inside the class. Otherwise if one wants the exact size, use pack() method. Dialog is considered as a window without having a menu bar. 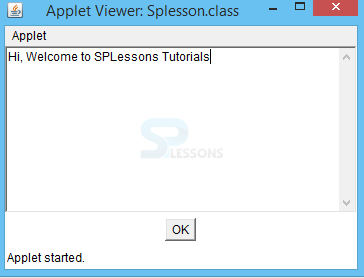 This sub class of window will help in taking inputs from the user and also gives alerts to the user. Dialog has a parent frame. If the parent frame is closed, the dialog frame also get closed. A Modal Dialog does not allow the user to interact with the application until there is some input action. It blocks all other windows of that application till it gets desired input. It is similar to the cookies. Non-Modal Dialog outputs a pop-up, however, it will allow the user to open other windows and communicate with the application. d.add(new Label("Hello Welcome to SPLessons." Container holds components by using add() method. FlowLayout is the default LayoutManager. Panel is a rectangular area. Frame is a window class with menu bar. Dialog accepts the user input and does not have menu bar. Window class cannot be used directly. One of its sub-classes, Frame or Dialog can be used as per the need.